which one will fly first? Oh, very nice. Traditional syllabics. Seasonality unobtrusively suggested. 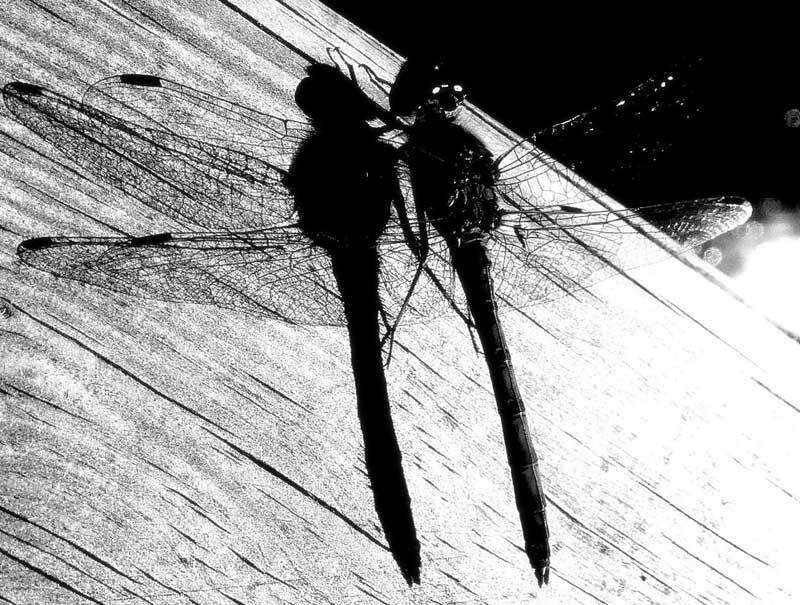 I enjoy the momentary optical illusion in the haiku, the race between insect and insect-shadow. And there’s the implication in the poem (made more explicit in the photo) of a mating pair. And even better, the submerged image of an insect entomologically mounted on a pin vs. the awareness that the actual insect can fly away at any moment. The photo acts as a contemporary haiga (graphic link to a haiku), too. Very pleasing. I mostly think of dragonflies for their colour, this highlights their elegance and line.